This is a new development and is commonly know as a key garage or vault. 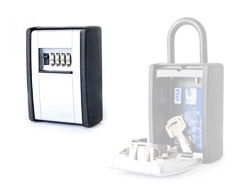 It is fundamentally a large combination padlock but includes a hollow case as part of its design allowing keys, credit cards, jewelery and other small items to be storage safely within. It is available it two versions. One comes with full fixtures to allow it to be screwed permanently to a wall. The other uses a removable shackle to attach it to pipes, a bike frame, door handles or a car chassis. The code is easily resettable from within the case and the shackle can also be removed. 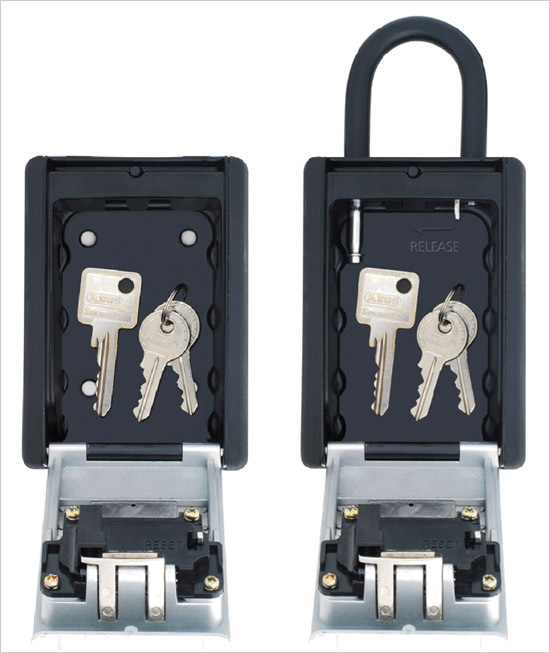 Once locked, both the case and shackle are secure and highly resistant to the weather. Please note that although it is ideal for outdoor use, water and condensation may get inside the casing and damage perishable items. A small sliding latch protects the combination dials from exposure to the elements also. Key garages can be used in many situations to store small valuable items within a house. The removable shackle version allows you to attach it to something securely such as a pipe, cable, door handle or bike frame. 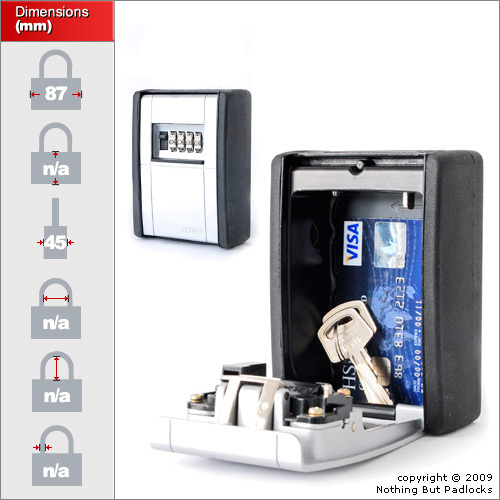 They are also popular to store car keys in whilst the vault is locked onto a part of the chassis or bumper out of view. These are popular for many sports. Canoeists often place their car keys in the vault and attach it to their car chassis. Joggers can put their house keys into the vault rather than carry them. Spare house keys can also be stored within the vault and hidden in a secret place rather than the obligatory "under the plant pot" or "door matt". A 4 dial precision combination mechanism is used to secure the vault with a sliding hardened steel plate to lock the shackle in place. The code is resettable and a sliding latch covers the dials from exposure to the elements.